...or at least part of it! If you've wondered what Airgun Hobbyist magazine is like to read before making a subscription, now you have a chance to read the first 10 pages of the latest issue at no charge. 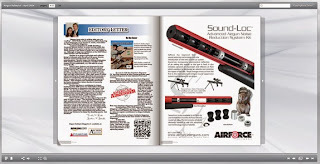 Airgun Hobbyist is now giving an online view of the first 10 pages of the latest issue. Here you can read a major report on the 2014 SHOT Show with lots of interest about many of the new products being introduced this year. It looks like this. Simply click on the page corner to turn to the next page. You can subscribe to Airgun Hobbyist - or order the latest issue - from Archer Airguns online store. If you buy the latest issue in hard copy, you'll also see many airgun reviews, including the one written by Stephen Archer and Paul Manktelow on the new Remington Express air rifle. 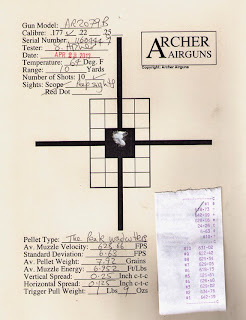 A New PCP Target Air Rifle - The AR2079B. 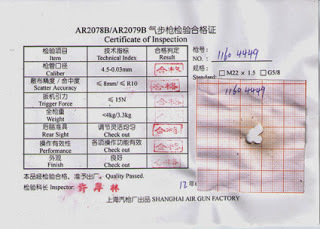 Our photograph above shows the Shanghai Airguns AR2079B target air rifle in PCP configuration. Just like other members of the QB79 family, the sidelever AR2079B can be configured with a Ninja 13/300 Regulated HPA tank and Archer Airguns QB79 Paintball Tank Adapter to work perfectly with high pressure air as a PCP. This gives a low cost way to obtain an accurate and useful target rifle for airgunners, although the stock design means that it's suitable for right-handed shooters only. Sorry lefties! 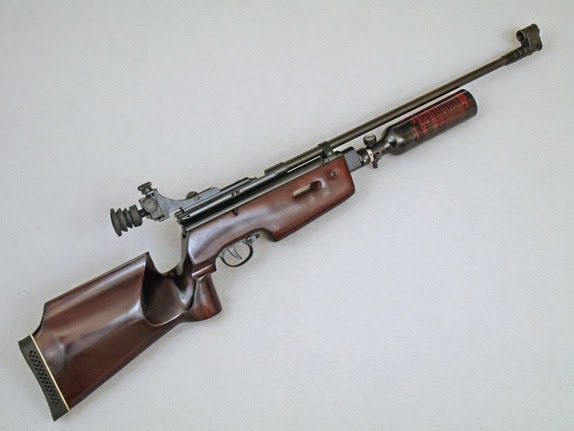 The AR2078B uses a lever action for bolt operation. 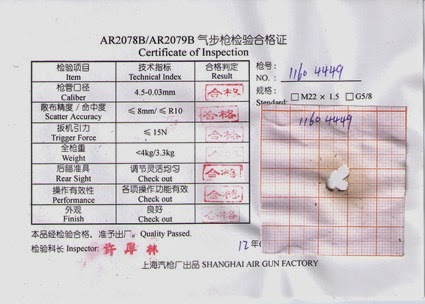 This is the smoothest and easiest-cocking version of the QB78 family and every one comes with a test target from the Shanghai factory as a proof of accuracy. 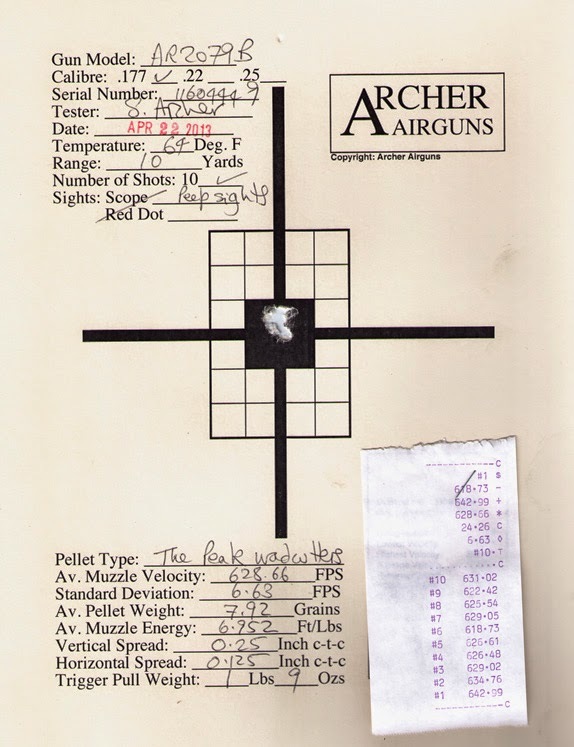 Below we have a factory test target and an Archer Airguns Gold Service test target for the same gun - shot on CO2 - that indicates the accuracy potential for the AR2078B. Both targets are 10 shot groups fired at 10 yards. Please note that the targets are not reproduced at the same scale, the Shanghai target is actually less than half the size of the Gold Service target. The latest PCP target rifle? It's an AR2079B!